DEC has received a Brownfield Cleanup Program (BCP) application for a site known as 2135 Westchester, site ID #C203093. This site is located in the City of New York, within the County of Bronx, and is located at 2135 Westchester Avenue, Bronx NY 10462. Comments regarding this application must be submitted no later than August 11, 2017. Click the web link above at "Additional Information" to learn how to comment. A copy of the application and other relevant documents are available at: Bronx Library Center, 310 East Kingsbridge Road, Bronx, NY 10458 -- and -- Bronx Community Board 9, 1967 Turnbull Avenue, Rm.7, Bronx, NY 10473. DEC has received a Brownfield Cleanup Program (BCP) application for a site known as 31 Tonawanda Street, site ID #C915299. This site is located in the City of Buffalo, within the County of Erie, and is located at 31 Tonawanda Street. A copy of the application and other relevant documents are available at: Riverside Branch Library, 820 Tonawanda St., Buffalo, NY 14207. DEC has received a Brownfield Cleanup Program (BCP) application for a site known as CE – E. 11th Street MGP – OU-3, site ID #C231105. This site is located in the Borough of Manhattan, within the County of New York, and is located at 181 Avenue D.
A copy of the application and other relevant documents are available at: NY Public Library – Tompkins Square Branch, 331 E 10th St, New York, 10009 -- and -- Manhattan Community Board 3, 59 E 4th St, New York, 10003. Then New York State Department of Environmental Conservation (NYS DEC), as lead agency, has determined that the proposed Draft Unit Management Plan (UMP) for the Saranac Lakes Wild Forest may have a significant adverse impact on the environment and a Draft Environmental Impact Statement has been prepared and accepted. Written comments are welcome and will be accepted, by mail or e-mail, by the contact person listed above until August 11, 2017. 625 Broadway, 4th Floor, Albany, NY 12233-3506, Phone: (518) 402-9655, Fax: (518) 402-9029 E-mail: gary.kline@dec.ny.gov. The NYC CSO Order was executed between the NYS DEC and the NYC DEP in 2005 and was modified in 2008, 2009, 2012, 2015, 2016, and 2017. The NYC CSO Order includes various milestones and projects associated with abatement of Combined Sewer Overflows (CSO) within New York City. Comments and Questions regarding the 2017 Jamaica Bay / Tribs LTCP Modification can be directed to the contact listed above. Each summer, the Friends of Five Rivers offer outdoor programs to help parents and children grow in their understanding and appreciation of the natural world through shared activities. Parents or caregivers and children must participate together. Registration is required. Summer Family Fun is a four-morning program for children ages 2-8, which will be offered July 25-28 and repeated August 1-4 and August 8-11. Go to www.friendsoffiverivers.org/node/87 for complete information, including fees and a registration form. DEC invites the public to comment about a proposed remedy to address contamination related to the 19 Patchen Avenue Site (Brooklyn), within New York's Brownfield Cleanup Program. Public comments about the proposal will be accepted through August 12, 2017. Project documents can be reviewed at: Brooklyn Public Library - DeKalb Branch, 790 Bushwick Ave., Brooklyn, NY 11221; phone: 718-455-3898 --and-- Brooklyn Community Board #3, Attn: Henry Butler, 1360 Fulton Street, Brooklyn, NY 11216; phone: 718-622-6601. Our new visitor center showcases a number of green building practices, both indoors and out. Learn about these elements and how they make our facility energy efficient and environmentally friendly. Bring your stroller or wagon and share a sensory exploration of nature with your young child. For children ages 3 and under. Registration required; call 716-683-5959 to sign up. The New York State Energy and Research Development Authority (NYSERDA) is leading the development of offshore wind on behalf of the State. Throughout 2017, NYSERDA is conducting extensive stakeholder outreach and directing more than twenty studies and surveys to ensure offshore wind is developed responsibly. This work will culminate in the New York State Offshore Wind Master Plan, to be released by the end of 2017. Central to the Master Plan is a concerted effort to gather input from various stakeholder groups, including commercial, for-hire, and recreational fisheries. 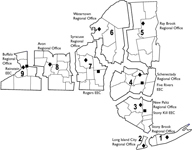 As part of its public outreach, NYSERDA invites you to several public open houses in August. Details are outlined below. The purpose of these open houses is to provide stakeholders with an opportunity to learn about the New York State Offshore Wind Master Plan. During these open houses, NYSERDA would also like to learn about the stakeholders of New York in an effort to understand and deconflict offshore wind development and operation. Any member of the public is welcome to attend. NYSERDA and NYSDEC representatives will be available for discussion. The Town of Brookhaven is co-sponsoring this saltwater fishing clinic with DEC. As the summer winds down, come out and join us for some snapper fishing and crabbing. Loner rods and free fishing bait will be provided. This clinic will focus on both snapper fishing & crab fishing techniques, fish biology and stewardship. Crabbing participants are encouraged to bring an uncooked package of chicken (drumsticks/legs work well), as event supply may be limited. Anglers may certainly bring their own saltwater fishing gear. There will be limited crab traps and nets to borrow if needed. Directions: I-495 (LIE) to exit 62. Take Nicholls Road south to the end. Make a left onto Montauk Hwy. Make a right onto Atlantic Avenue. Make another right onto Middle Road. Make a left onto Corey Avenue and continue to the end. No Saltwater Fishing Registry is needed during the hours of this event. The Draft Unit Management Plan (UMP) sets forth the proposed goals, objectives, management actions and associated costs for the approximate 4,549 acres. It offers general information on the unit's history and geology, an inventory of the unit's resources, such as vegetative types and stages, fish, wildlife and habitat. Comments may be submitted on the proposed plan to the contact listed above until September 18, 2017. DEC and Department of Agriculture and Markets are offering two workshops on the Emerald Ash Borer (EAB) for forest landowners in Oswego and Oneida counties. DEC is offering a workshop on the Emerald Ash Borer (EAB) for forest landowners in Oswego County. EAB is a small but destructive beetle that infests and kills North American ash tree species. DEC invites the public to comment about a proposed remedy to address contamination related to the CE - E. 138th St. Bronx Works Site, within New York's Voluntary Cleanup Program. Public comments about the proposal will be accepted through August 17, 2017. To learn about the proposal and how to comment, click the web link above at "Additional Information". Project documents can be reviewed at: Bronx Community Board 1, Attn: Cedric Loftin, 3024 Third Ave., Bronx, NY 10455; phone: 718-585-7117; --and-- Bronx Borough President's Office, Attn: James Rausse, 851 Grand Concourse, Planning & Development Office, Room 209, Bronx, NY 10451; phone: 718-590-3514 --and-- Mott Haven Branch, New York Public Library, 321 East 140th Street, Bronx, NY 10454; phone: 718-665-4878. DEC has received a Brownfield Cleanup Program (BCP) application for a site known as 145-65 Wolcott Street, site ID #C224256. This site is located in Brooklyn, New York, at 145-65 Wolcott Street. Public comments about the application will be accepted through August 18, 2017. Click the web link above at "Additional Information" to learn more about the site and how to comment. The application can be reviewed at: Red Hook Library, 7 Wolcott Street, Brooklyn, NY 11231 --and-- NYC Community Board 6, 250 Baltic Street, Brooklyn, NY 11201. DEC has received a Brownfield Cleanup Program (BCP) application for a site known as 234 Butler Street, site ID #C224261. This site is located in Brooklyn, New York, at 234 Butler Street. Public comments about the application will be accepted through August 18, 2017. The application can be reviewed at: Brooklyn Public Library - Pacific, 25 4th Avenue, Brooklyn, NY 11217 --and-- Brooklyn Community Board 6, 250 Baltic Street, Brooklyn, NY 11201. 625 Broadway, 11th floor, Albany, NY 12233-3256. NYS DEC is requesting a waiver to adjust the requirements of the Photochemical Assessment Monitoring Stations (PAMS) monitoring program to more effectively meet the data collection needs in New York. Written comments on this waiver should be forwarded to the NYS DEC by August 18th, 2017 and addressed to the contact listed above. Seneca Meadows, Inc. (SMI) has submitted a Part 360 Solid Waste Management Renewal and Modification application for a 360‑acre landfill located on Route 414 in the Town of Seneca Falls, Seneca County, New York. The first session will begin at 3:00 pm and the second session will begin at 6:00 pm. The public comment sessions are to receive unsworn comments on the proposed project. How to Provide Your Comments: Any interested person may submit comments in writing, or verbally at the public comment session. All comments will be considered in making the final decision about issuance of the permit. Written comments about the permit application must be RECEIVED BY August 18, 2017 to be considered and should be sent to the contact listed above. DEC invites the public to comment about a proposed revised plan to address contamination related to the 229 Homer Street Site (Olean, Cattaraugus Co.), within New York's Brownfield Cleanup Program. Public comments about the proposal will be accepted through August 18, 2017. Project documents can be reviewed at: Olean Public Library, Attn: Lance Chaffee, 134 N. 2nd Street, Olean, NY 14760-2583; phone: 716-372-0200. DEC invites the public to comment about a proposed remedy to address contamination related to the RGE - West Station Site (Rochester, Monroe Co.), within New York's Voluntary Cleanup Program. Public comments about the proposal will be accepted through August 18, 2017. Project documents can be reviewed at: Rochester Public Library, Rundel Branch, 4th Floor, 115 South Ave., Rochester, NY 14604; phone: 585-428-8440. DEC invites the public to comment about a proposed remedy to address contamination related to the RGE - Pavilion (T) - Ellicott Street Road Site (Pavilion, Genesee Co.), within New York's Voluntary Cleanup Program. Public comments about the proposal will be accepted through August 18, 2017. Project documents can be reviewed at: Pavilion Public Library, 5 Woodrow Drive, Pavilion, NY 14525; phone: 585-584-8843. Summer Evenings Together 2 (Family Game Night), offered as two different one-evening sessions: July 11 and August 18. Play large-group nature games with other participating families and learn about the lives of animals. Also see Summer Evenings Together 1 (Birds and Bird Watching) takes place over four evenings: July 18, 20, 25 and 27. Learn about birds and observing birds through hands-on activities. Details for both programs, including fees and a registration form, can be found at http://www.friendsoffiverivers.org/node/178. DEC invites the public to comment about a proposed remedy to address contamination related to the 538-544 Hudson Street Site (Manhattan), within New York's Brownfield Cleanup Program. Public comments about the proposal will be accepted through August 19, 2017. Project documents can be reviewed at: New York Public Library - Hudson Branch, 66 Leroy Street, New York, NY 10014; phone: 212-243-6876 -- and -- Queens Community Board 12, 90-28 161st Street, Jamaica, NY 11432. Join us for this program geared for children 4-9 years old. We’ll play games, make crafts, and meet some real turtles while learning all about these hard-bodied reptiles. Then we’ll head outside for a walk on Five Rivers’ trails to search for wild turtles sunning in the ponds. Space is limited. Please call 518-475-0291 to register by Monday, August 14. Did you know that six different species of squirrels reside at Five Rivers? We will begin this presentation indoors with an in-depth discussion of our local squirrels. Then we’ll head outside to look for the many signs of the lives these fascinating creatures live. DEC invites the public to comment about a proposed remedy to address contamination related to the Steel Treaters, Inc. Site (Troy, Rensselaer Co.), within New York's Voluntary Cleanup Program. Public comments about the proposal will be accepted through August 20, 2017. Project documents can be reviewed at: Troy Public Library, 100 Second Street, Troy, NY 12180; phone: 518-274-7071. NYS DEC has filed a Notice of Proposed Rule Making to repeal 6 NYCRR Part 500 - Floodplain Management Regulations Development Permits. The statutory authority for Part 500, which came from Environmental Conservation Law Article 36, was repealed by the Legislature in 1992. Part 500 has not been in effect since 1992 and should not appear in NYS DEC's regulations. NYS DEC is proposing to remove it from its regulations to avoid confusing the public. This rule would also amend citations to 6 NYCRR Parts 750-758 - State Pollutant Discharge Elimination System. Parts 750-758 were repealed in 2003 and consolidated into a new Part 750. Written comments on the proposed rulemaking will be accepted until August 21, 2017. Please submit comments to Michelle Tompkins at the address above. DEC invites the public to comment about a proposed plan to address contamination related to the Willetts Creek Wetland Areas portion of the Dzus Fastener Co., Inc. Site (West Islip, Suffolk Co.), within New York's State Superfund Program. Public comments about the proposed plan will be accepted through August 21, 2017. A public meeting also has been scheduled to discuss the proposed plan: Wednesday, August 9, 2017 at 7:00PM at the West Islip Public Library, 3 Higbie Lane, West Islip, NY. Click the web link above at "Additional Information" to learn about the proposed plan, the meeting, and how to comment. Project documents can be reviewed at the West Islip Library at the location identified above, attention: Donna MacGilvray; phone: 631-661-7080. 625 Broadway, 11th Floor, Albany, NY 12233-3251, Phone: (518) 402-8396, or by e-mail to: dar.sips@dec.ny.gov. Written comments should be submitted by 5:00 p.m. on August 28, 2017 to the contact listed above. Join in this summer’s Living Environment Institute (LEI), Wild about Wetlands, as we explore these varied and sometimes highly specialized habitats. Wetlands are accessible to teachers and educators throughout New York State. They include river shores, vernal pools, swamps, streams, salt marshes and more. We’ll view wetlands across disciplines, seeking to use them as a catalyst for student interest and learning. Chris Bowser, recipient of U.S. EPA’s Environmental Quality Award, will join staff from Five Rivers Environmental Education Center to lead investigations of a variety of wetland habitats. During a field experience, LEI participants will learn first-hand why his programs in the Hudson River watershed engage thousands of New York students and hundreds of educators annually. Bring home valuable ideas, standards-based curriculum and activities, and connect with a network of peers. Visit www.dec.ny.gov/education/1905.html for more information. There will be a meeting on Tuesday, August 22, 2017 at the New York State Department of Environmental Conservation (NYS DEC) Headquarters, 625 Broadway in Room PA 129 from 10:00 a.m. to 3:00 p.m. of the Joint New York Invasive Species Council and Invasive Species Advisory Committee. The agenda includes three programmatic discussion items followed by a workshop to elicit input for the development of a comprehensive management plan. Experience nature at your own pace, and enjoy a leisurely guided walk through the woods. Bring a lunch if you want to eat outdoors after the tour. For adults only. Registration required; call 716-683-5959 to sign up. NYSDEC will host a public availability session to provide information on two recently finalized habitat management plans: Canadaway Creek Wildlife Management Area (WMA) located in the Town of Arkwright, and Kabob WMA located in the Town of Stockton, both in Chautauqua County. Come join us to learn about the goals of the plans and future management at these WMAs. The meeting will include a presentation and time for questions. An open house will begin at 6:00 and a formal presentation at 6:30. The Canadaway Creek plan can be viewed at Canadaway Creek WMA webpage and the Kabob plan at Kabob WMA webpage. For more information, contact Greg Ecker at 716-851-7010. Take a walk to look for birds by the ponds and in the woods. Parent or caregiver must accompany child. For children ages 8-12. Registration required; call 716-683-5959 to sign up. DEC has received a Brownfield Cleanup Program (BCP) application for a site known as 1550 Harlem Road, site ID #C915321. This site is located in the Village of Sloan, Town of Cheektowaga, Erie County, at 1550 Harlem Road. Public comments about the application must be submitted no later than August 25, 2017. To learn about the site and how to comment, click the web link above at "Additional Information". Project documents can be reviewed at: East Clinton Branch Library, 1929 Clinton St., Buffalo, NY 14206. DEC has received a Brownfield Cleanup Program (BCP) application for a site known as Former Peninsula Hospital Site, site ID #C241200. This site is located in Far Rockaway, Queens, at 51-15 Beach Channel Drive and 50-04 Rockaway Beach Boulevard. Comments about the application must be submitted no later than August 25, 2017. Project documents can be reviewed at: Archives at Queens Library, 89-11 Merrick Boulevard, Jamaica, NY 11432 --and-- Queens Community Board #14, 1931 Mott Avenue, Far Rockaway, NY 11691. DEC has received a Brownfield Cleanup Program (BCP) application for a site known as Long Island Railroad Yaphank Site, site ID #C152146. This site is located in the Hamlet of Yaphank, Town of Brookhaven, Suffolk County, east of River Road, south of railroad tracks. Public comments about the application must be submitted no later than August 25, 2017. Project documents can be reviewed at: Mastics-Moriches-Shirley-Community Library, 407 William Floyd Parkway, Shirley, NY 11967-3492. 6739 US Highway 11, Potsdam, NY 13676, Phone: (315) 274-3336, E-mail: tony.sparacino@dec.ny.gov. The New York State Department of Environmental Conservation (NYS DEC) will accept public input on the St. Lawrence Foothills Draft Unit Management Plan (UMP) at an open house on July 25, 2017 from 6:00 p.m. to 8:30 p.m., at the Potsdam Central High School Auditorium, 29 Leroy St, Potsdam, NY 13676. All comments must be received by August 25, 2017. The St. Lawrence Foothills UMP is located in the Towns of Colton, Hopkinton, Parishville, Potsdam, Pierrepont, and Russell, in St Lawrence County, New York. Held at Gantry Plaza State Park and at Pier 51 along Hudson River Park. Only WHO can prevent wildfires? That’s right, YOU! Join us for a celebration of all things outdoors as we wish Smokey Bear a happy 73rd birthday! On August 26, 2017, the New York State Department of Environmental Conservation will be celebrating at Gantry Plaza State Park from 10 a.m.-1 p.m.
And on Pier 51 along the Hudson River Park from 2:30 p.m.-5:30 p.m. This fun-filled, free event will feature hands-on activities for visitors of all ages including a meet and greet with Smokey Bear and a DEC forest ranger, crafts and a Smokey Bear poster contest, scavenger hunts, party favors, and more! Learn how monarch butterflies are tagged and recorded for research, then release them for their journey down south. For adults and children ages 10 and older. Registration required; call 716-683-5959 to sign up. In honor of Roger Tory Peterson’s birthday on August 28, we’ll take a look at the life of the man who introduced so many people to birds. With the publication of his Peterson Field Guide to the Birds, he introduced a system of identifying birds that made sense to the layman. After a brief indoor presentation on the life of the man who did so much to popularize birding and bird conservation, we will head afield—with Peterson field guides—to identify some of Five Rivers’ resident birds using the Peterson system. A limited number of binoculars will be available for loan. Why do birds migrate? Learn which species to look for as they prepare for their long journey south. For adults and children ages 8 and older. Registration required; call 716-683-5959 to sign up. On June 26, 2017 the New York State Department of Environmental Conservation filed a Notice of Proposed Rule Making with the Department of State to amend 6 NYCRR Parts 44 and 50 and modify the regulations concerning terrapin exclusion devices on crab traps, commercial horseshoe crab harvests, and the reporting of commercial whelk harvests. This notice was published in issue 28 of the State Register on July 12, 2017. There will be a 45-day public comment period on the proposed rule beginning July 13, 2017 and ending August 28, 2017. The Town of Riverhead is co-sponsoring this saltwater fishing clinic with DEC. Wind the summer down with a summer event of snapper fishing. Loner rods and free fishing bait will be provided. This clinic will focus on both snapper fishing, recreational fishing regulations, fish biology and stewardship. Anglers may certainly bring their own saltwater fishing gear. Directions: I-495 (LIE) to exit 71. Make a right onto NY 24. Drive 4.5 miles to the traffic circle and take the forth exit (3/4 around circle) onto Peconic Avenue. Make the first right into the Town of Riverhead parking lot at Peconic Riverfront Park. The public is invited to attend a public meeting and comment on the Draft Unit Management Plan (UMP) which will guide management of the Ontario Plains Unit for the next ten years. The meeting will be held Thursday, July 27, 2017 at 7:00 p.m. at the Dulles State Office Building, 317 Washington Street, Watertown, New York. Written comments will be accepted until August 30, 2017. Those unable to attend the meeting may submit comments by mail to the contact listed above or by e-mail to the address listed above. This notice announces the availability of two draft tentatively approved specifications on Batteries (new) and Single Use Food Containers (amended). The two specifications were tentatively approved by the Interagency Committee on Sustainability and Green Procurement (Committee) co-chaired by the Commissioners of the New York State Office of General Services (NYS OGS) and the New York State Department of Environmental Conservation (NYS DEC) on April 28, 2017. Public comment on the draft specifications will be accepted at least through August 30, 2017. Comments should be submitted to the name and contact information listed above. 2016-2017 Annual Hunting and Trapping License Year Final Day - permits are valid from September 1, 2016 thru August 31, 2017. DEC invites the public to comment about an investigation report and proposed cleanup measures to address contamination related to the 11 Spencer Street Site (Brooklyn), within New York's Brownfield Cleanup Program. Public comments about the proposal will be accepted through August 31, 2017. Project documents can be reviewed at: Brooklyn Public Library - Clinton Hill Library, Attn: Tracey Mantrone, 380 Washington Ave., Brooklyn, NY 11238; phone: 718-398-8713 --and-- Brooklyn Community Board 3, Attn: Charlene Phillips, 1360 Fulton St., Room 202, Brooklyn, NY 11216; phone: 718-622-6601.